Sweden's ambassador to Israel says Swedish authorities have failed to protect the Jewish community and that shouldn't happen. Swedish authorities have failed to protect the country’s Jewish community, the Scandinavian country’s ambassador to Israel admitted Friday following anti-Semitic incidents in Malmo and in Gothenburg, JTA reports. 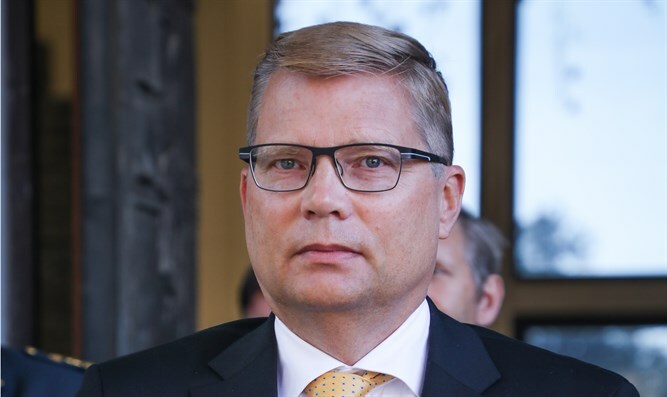 The ambassador, Magnus Hellgren, made the comments in an interview for the Israeli daily Makor Rishon following an attempted torching of the Gothenburg synagogue and cries about killing Jews in Malmo. Both events happened amid protests over President Donald Trump’s December 6 recognition of Jerusalem as Israel’s capital. Police officers who heard the cries to shoot Jews during the Malmo rally would have intervened, but the cries were in Arabic and the “officers simply didn’t understand,” Hellgren stated. He also said the Swedish state has not given local Jewish communities the resources they asked for to provide security, and said this problem is being addressed. Hellgren insisted Sweden does not have an anti-Israel foreign policy, though in the past the country’s Foreign Minister Margot Wallstrom has come under fire for her harsh anti-Israel comments. In 2014, then-Foreign Minister Avigdor Liberman denounced Sweden’s decision to recognize the PA as "the State of Palestine", saying that “relations in the Middle East are a lot more complex than the self-assembly furniture of IKEA”. Following that incident, Wallstrom accused Israel of being “extremely aggressive” and accused the Jewish state of “irritating its allies”. In December of 2015, she attacked Israel again, claiming during a debate in parliament that Israel was “executing” without trial terrorists who carried out stabbing attacks in Israel. Several weeks before that, the Swedish minister provoked a firestorm of criticism, when she appeared to blame the terrorist attacks in Paris on "Palestinian frustration" with Israel.